Just about everyone around Jasmine (Cate Blanchett) is rotten. Her husband Hal (Alec Baldwin) had numerous affairs and was eventually arrested over various financial corruption charges. Her divorced sister Ginger (Sally Hawkins) refuses to stay away from a horrible boyfriend, Chili (Bobby Cannavale). The dentist (Michael Stuhlbarg) she works for is a harassing womanizer. Like I said, almost everyone around in her life is rotten. Even her. This is what’s so intriguing about Blue Jasmine, Woody Allen’s latest film, which many have pointed out bears similarities to the plot of Williams’ A Streetcar Named Desire. There are good characters who have flaws you are willing to overlook, and there are bad characters with flaws you wouldn’t ignore if you were paid to. But is Jasmine good or bad? We know that something’s off about her. Either she’s the good saint of the movie, thrown off a good path because of what’s transpired in her life, or she’s the worst person of them all, lying, manipulating, and making stupid decisions (flying first class even though she adamantly states she’s broke). Anyway, to get away from the tragic ends of New York, Jasmine decides to move to San Francisco, where Ginger and Chili are. She wants to be an interior designer, and pays her way through the online classes required with the job as the dentist’s receptionist. The stress contained within her life before have driven her to depression and breakdowns. The character is seen popping pills enough times to solidify questions of a disorder. Like any good character drama, there’s a lot of shouting, drinking, and a light dose of breaking things. But it has one thing that most of the like lack – the ability to induce nervous laughter. You’re going to laugh several times during this picture, but usually not because of a formal joke, but a genuine uncomfortable feeling over the transpiring events. It is fairly monumental the unfortunate existence that Jasmine lives, and the question impeccable on whether or not her apparent mental imbalance was the catalyst for much of the misfortune, or it was caused by it. However, there’s still an intense sympathy for the character, and the fact that you feel great interest in a pretentious, distant woman with faded delusions of grandeur is a testament to wonderful writing by Woody Allen and an absolutely amazing performance from Cate Blanchett. 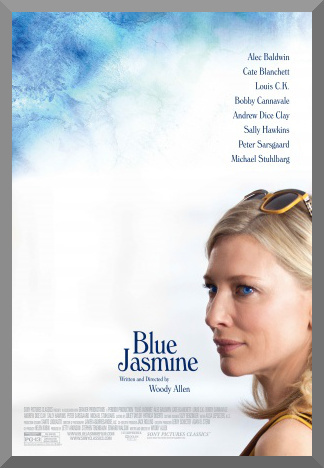 Blue Jasmine contains a truly marvelous cast, each needed to keep the film going through its 98 minutes. Seriously, everyone’s great, from Blanchett to Baldwin to Hawkins to Andrew Dice Clay as Ginger’s ex-husband. The only genuine issue could be the otherwise creative decision to seamlessly integrate flashbacks to Jasmine’s socialite life into the story. While it’s not hard to tell when a scene like that is in motion, it sometimes makes the overall flow a bit choppy. Blue Jasmine isn’t a groundbreaker in even the lightest sense of the word, but that doesn’t change its quality, rich with many memorable details. Its title is symbolic of both the supposed naming history of the main character, and the emotions conveyed throughout. A particularly melancholy jazz piano rendition of “Blue Moon” travels throughout, a callback to the song playing when Jasmine and Hal first met. It is a worthy and layered film, tragic in its characters, brilliant in its portrayal.